Here's something to discuss: Climate alarmists who don't even know their own field of science. 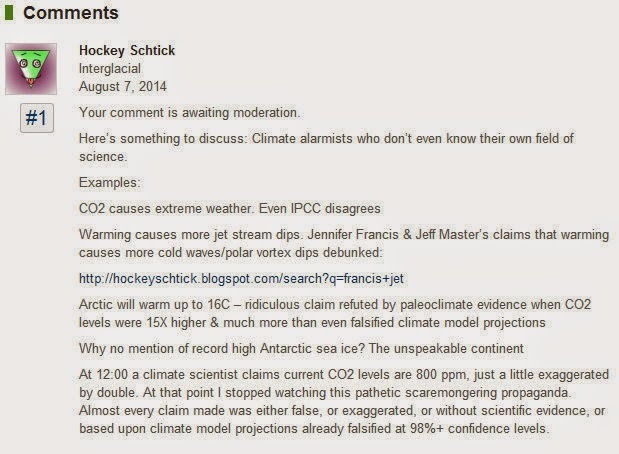 At 11:40 a climate scientist claims current CO2 levels are 800 ppm, just a little exaggerated by double. At that point I stopped watching this pathetic scaremongering propaganda. Almost every claim made was either false, or exaggerated, or without scientific evidence, or based upon climate model projections already falsified at 98%+ confidence levels. Meanwhile, the Arctic isn't listening to the alarmists and is staging a big recovery in sea ice this year, of course never mentioned in this new propaganda film, which instead claims Arctic sea ice loss is accelerating. 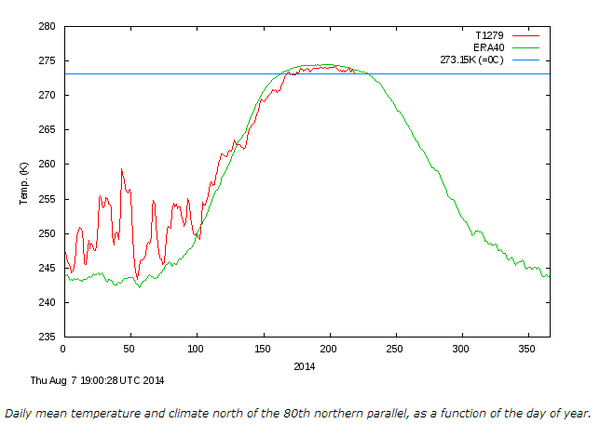 Arctic sea ice is controlled by winds, storms, and ocean oscillations, not CO2. Other inconvenient unspeakable truths that for some reason aren't mentioned in the film include Antarctic sea ice at record high levels, and that global sea ice is above the mean. Note to Greg, Tom Nelson found it for me, no crystal ball or Oz powers needed. Reader poll – should I sue the pants off Greg Laden? WUWT at the top of the heap? I wonder if we "deniers" were to post the following surprisingly non-alarmist IPCC quotes on sites like these----would they then call the IPCC (WG1 anyway) scientists "deniers"? "It is very likely that the annual Antarctic sea ice extent increased at a rate of between 1.2 and 1.8% per decade between 1979 and 2012." Greg Laden is a serial idiot. He keeps denying the record Antarctic sea ice extent, even though according to this (http://nsidc.org/arcticseaicenews/2014/08/sled-dog-days-of-summer/) they've finally had to admit that, yes, Antarctic sea ice extent is at a record high. I posted that link and a couple of quotes from the article at Laden's site, and amazingly, it's still there, but who knows how long he'll let such blasphemy stay in place.